It is safe to say that technology impacts so much of our world. Thanks to technology, illnesses and medical conditions physicians and researchers weren’t able to cure before are now treatable. It has also made it easier for doctors to accurately diagnose diseases, thus, giving patients enough time to address and find treatment for their conditions. Beyond treating people, technology has also made life easier and more convenient for individuals needing care, including the elderly, as well as for their care providers. As many of us know, entrusting the care of aging family members to others is never easy. However, it is sometimes necessary. Often times, professional care providers and senior-care facilities are better equipped at handling the task of helping fulfil the everyday needs of the elder-care community. If you have a family member currently living in a senior-care community, it is important to seek out locations that are using the latest technology and are equipped with advanced facilities so they can better care for patients and residents. For example, CareOne King James in New Jersey, recently launched a new treatment program designed to ensure the quick recovery of stroke survivors. According to recent statistics, strokes are the leading cause of adult disability in our country, with 4 million survivors being unable to return to their previous lifestyle and requiring the assistance of another person in order to carry out even the most basic of activities. As such, CareOne King James’ new stroke recovery program is based on the research that immediate medical rehabilitation techniques and the use of medical technology can pave the way for more rapid and complete recovery and care. The facility utilizes specialized therapeutic equipment that not only helps stroke-recovery patients, but has also been used in the regime of professional athletes for more than three decades. In addition, technology is positively impacting rehabilitation through virtual components. For example, CareOne’s Holmdel and Ridgewood Avenue facilities utilize cutting-edge technology to provide patients with better services, including the OmniVR™ Virtual Rehabilitation System. This innovative system lets patients perform interactive exercises and activities using a computer-generated environment under the guidance of therapists. It introduces challenging virtual tasks to the patients undergoing rehabilitation therapy without placing their health and safety at risk. CareOne Senior Director of Education and Development, Robert Clark, PT, DPT, who has published research on virtual reality, notes this advanced method of rehabilitation made it easier for both patients and therapists to achieve rehab goals. He explains, “It allows us to monitor each patient and provides therapists with objective data on patient performance.” In addition, OmniVR has even motivated patients to undergo rehab for longer periods of time than before. 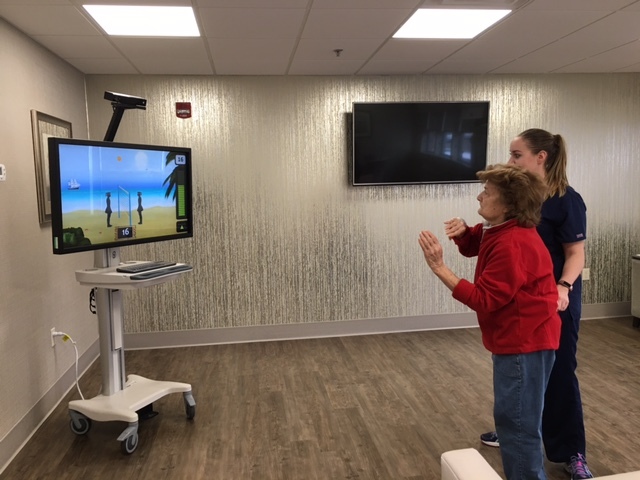 Further, CareOne’s Ridgewood Avenue center also has a brand new Activity of Daily Living (ADL) suite that was built in their rehabilitation therapy gym. This ADL suite provides a simulation of the patient’s home environment, helping them get used to doing their day-to-day activities and better making the transition from being in rehab to resuming their daily lives. Some of the activities included in the simulation are getting in and out of the bathtub and bed, making the bed, bending to retrieve items from low shelves in the refrigerator, reaching to get items from high cabinets, cooking, serving food, setting the table, washing dishes and doing laundry. Of course, each simulation is being carried out under the supervision of experienced therapists so relatives of the patients can rest assured that their loved ones are safe at all times. Like many senior care facilities throughout the country, CareOne, under the direction of CEO Daniel Straus, continually works to develop ways to better serve their patients by integrating technologically advancements into their care and rehabilitation programs. Thanks to technology, it is safe to say that healthcare has come a long way and continues to evolve. People are living longer and are enjoying a more satisfying lifestyle. And patients and residents of senior-care facilities are receiving better and more effective services. As you navigate the sometimes difficult journey of selecting a rehabilitation or senior-care facility for your loved one, be sure to seek out locations that are continually investing in technology to advance patient care. Family members shouldn’t have to worry about whether their loved ones are in good, capable hands. Nor, should they be concerned as to whether their relatives are receiving the most progressive treatments available to them. With advancements in medical and rehabilitation technology, and the advent of more advanced medical equipment, family members should rest easy knowing the best possible care is available to their loved ones. Do you have questions about how technology can positively impact the life of a family member or loved one seeking elder-care services? Visit the CareOne website for more information.